Environmental legislation demands ever stricter efficiency and control of emissions from industrial boilers, furnaces and other power plant processes. For example, in the USA the Environmental Protection Agency has recently introduced the MACT (Boiler Maximum Achievable Control Technology) Rule requiring operators to carry out tune-up procedures either annually or bi-annually, affecting an estimated 14,316 boilers and process heaters, whilst other nations’ legislation is equally onerous. The precise and swift operation of dampers for the accurate control of combustion air and flue gas is essential for the achievement of reduced emissions, improved boiler draft control and lower fuel consumption, which can also result in dramatic cost savings. 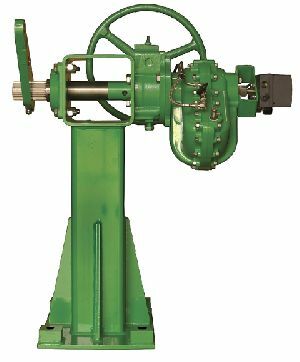 However, many boilers employ old technologies that are not accurate or powerful enough to position the dampers with the necessary speed to meet contemporary requirements. Replacing obsolete equipment with fast acting Rotork Type K damper drives offers many advantages, contributing to improved burner management and cleaner performance. In addition, the Type K offers a swift ‘drop-in-place’ retrofit solution that precisely fits the application without any field engineering or fabrication. Existing connection rods and linkages can be used without modification; commissioning is quickly and simply completed. Type K damper drives provide a 100% duty cycle, with a continuous modulating service rating of 3,600 starts per hour. An output torque of up to 28,200 Nm (20,800 lbf ft) is available with high speed stroke times as low as 3 seconds full scale. The rugged, open frame construction is designed for virtually maintenance-free operation in harsh, high temperature environments up to 150ºC (300ºF). The vane type pneumatic actuator delivers fast and accurate positioning and reduces overall operating air consumption. A wide range of control system interfaces encompasses pneumatic, analogue and bus network communication systems, including Profibus, Foundation Fieldbus, HART and Modbus open protocols. The Type K is proven to deliver high speed continuous modulation of ID (Induced draft) and FD (Forced Draft) fans, inlet guide vanes and secondary air dampers, enabling improved burner management, a swift response to plant demand and low running costs. The wide choice of control and automation options introduces predictive maintenance and diagnostic capabilities to further improve long term plant utilisation.